At Firefly Collection we know that the best ski holidays are not just about what happens on the slopes but the entire ski experience, from cosying up in your luxurious chalet to enjoying the après-ski activities in your resort. Another important element of the ski experience for many is the ski fashion. Ski style has changed dramatically over history and as we enter a new year we thought it would be fun to look back on the iconic ski fashions from each decade. 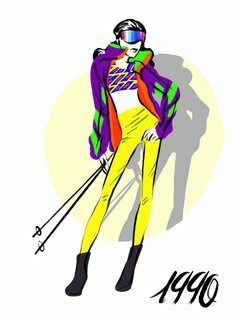 In our new illustrative series ‘Cold Couture’ we have sketched the iconic ski styles through the 1910s to the 2000s –including the formal wear of 1910, the sleek and stylish 60s, and the bright neon 80s. 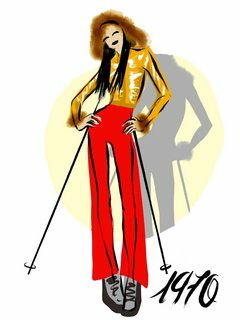 Have a look at our illustrations below to find out more about the iconic ski fashions of each decade. Ski fashion in the early 1900s through the 1910s certainly prioritised style over practicality. Prior to the early 1900s ski was primarily dominated by men, and the early female ski fashions show that women’s skiwear was an unchartered territory. 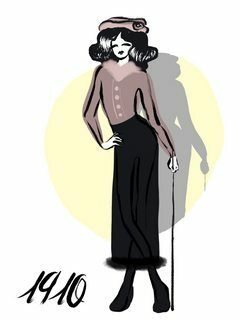 Women’s skiwear consisted of long skirts, heavy coats and a stylish if extraneous hat. During this time all skiers only used one ski pole. 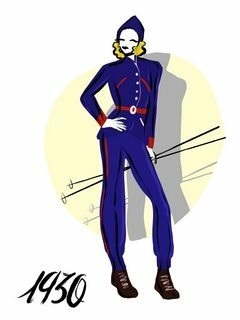 The 1920s ski fashion is both iconic and momentous, and reflects the wider fashions of the era. 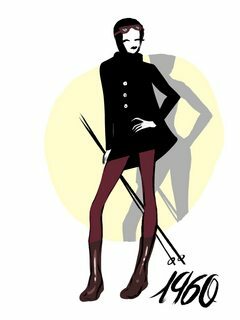 The impact of WWI influenced women’s fashion at this time, and the tunic and breeches common with the British Land Girls translated over to ski styles as well. It became the norm for women to wear trousers for skiing, though wearing trousers for everyday activities was still considered scandalous. Generally, ski fashion moved towards functionality over formality, with increased comfort and easier mobility being prioritised. In 1924 the first Winter Olympics further encouraged a move towards practical skiwear. 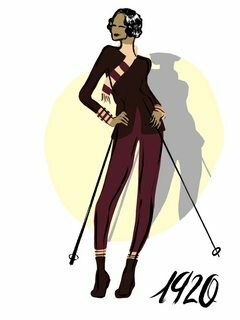 In the 1930s the introduction of ski lift and rope pulls began the advent of downhill skiing, and this newly popular style of skiing influenced upon the ski fashions of the time. A need for ‘aerodynamic’ skiwear was introduced with skiers looking for tighter clothing which would allow for quicker and easier downhill movements. Tailored jackets were cinched in at the waist, while trousers moved towards a slimmer fit. A pointed hat finished off the look, in-keeping with the wider hat style of the era. Garments continued to be made of thick wool, but experimentation with waterproof clothing began. In the 1940s the 2-piece ski outfit continued to evolve, with a greater array of colours and patterns being utilised. Hats were often replaced with a more stylish headscarf, which was a popular fashion for women of the time, along with a greater popularity of large-framed sunglasses. Meanwhile, manufacturers continued to look towards prioritising functionality and warmth. In the 1950s manufacturers began experimenting with fabrics which were lighter while still retaining heat. The heavy wools of previous decades started to get left behind, and ski garments became lighter and much more fitted. Polyester was introduced in 1953 allowing for the production of ski sweaters, which wear affordable for the wider recreational ski market which took off during this decade. The oversized and quirky sunglasses remained a popular accessory. The sleek and stylish 60s brought an era of glamour to the slopes. Fashion took its cues from the sophisticated Hollywood stars of the time, such as Audrey Hepburn. Black was the colour of choice, along with other muted shades. 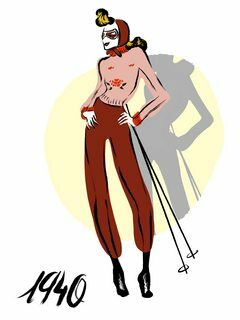 Trousers were slim-fit while elegant cape jackets and sleek ‘snoods’ topped off the look, along with an elegant pair of dark wide-frames sunglasses. 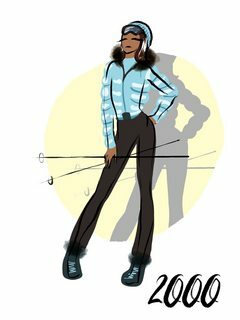 Away from the high-fashion styles, spandex was invented in the 1960s starting the production of the ski fashion to come. In the psychedelic 70s the groovy vibes of the dancefloors took to the slopes as well, with bright colours, bold patterns and fake fur decorating the garments of the time. Ski trousers were influenced by the popular flares of the era, while the most notable ski garment of the fun-loving 70s had to be the platform moonboots. By the 1970s, wool was all but eliminated from ski garments entirely, with synthetics being used instead to create skiwear which crossed over into streetwear. Perhaps the most iconic era of all? The 80s brought neon colours, geometrical patterns and big hair. Onesies and bib overalls were a hot trend, while stretch pants and patterned anoraks were also commonplace. It really was a case of the brighter, the better in the 1980s. 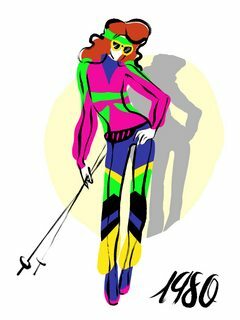 The neon colours of the 80s continued into the 90s, with ski fashion in this decade remaining a bright affair. The crop top was a classic garment of 90s fashion, and this trend was taken to the slopes along with high-waisted leggings. To a modern-eye the 90s fashion didn’t differ massively from the 80s, but at the time the sleeker hairdos and slightly tamer patterns appeared to be a move towards a more sophisticated style. The 2000s was a move towards the typical skiwear popular today. The neon colours were replaced with pastels and muted greys and blacks. The practical 2-piece outfits returned with fitted trousers and warm jackets, topped with stylish hats and sunglasses. The era certainly moved towards a more relaxed and sleek look than that of the 80s and 90s. Faux fur became a popular choice again, adding that touch of glamour for those who were looking to share their ski snaps on their social media – a phenomenon which started taking off towards the end of this decade. 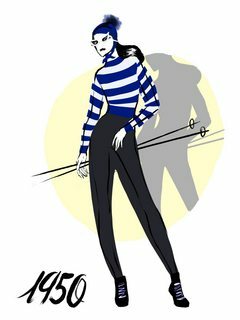 Looking back on ski fashions over history, it is interesting to see how the ski style relates to the trends and culture of the era – influenced by societal attitudes, current events, celebrities and the manufacturing of new materials. Who know what the future of ski fashion holds next? Planning your next ski holiday? Have a look at our luxury ski chalets.